GQ writer Julia Ioffe quickly apologized Monday after claiming President Trump had radicalized more people than ISIS on CNN’s The Lead with Jake Tapper. The Islamic State ideology is one of murder, conquest at any cost, and sheer brutality against women, infidels, apostates and the like. Ioffe could never put her own words to the test by confronting Islamic State jihadists, because she would end up being tortured and killed, yet these are the barbarians to whom she compares the elected President of the United States. Many may merely dismiss Ioffe as unbalanced, but what about the host of the show, Jake Tapper? It is obvious that all who do not adhere to Islamic State ideology need protection from them, so Ioffe is implying that American society needs to protect itself from Donald Trump. Not only is her thinking astonishingly delusional; her mindset is also dangerous. Groups such as Antifa and other leftist troublemakers and anarchists are searching for any and every excuse to resort to violence against Trump and his supporters, and they are being egged on by destructive elements in the media, and even by politicians. Recall when Rep. Maxine Waters called for public confrontation and harassment of members of the Trump administration, stating: “Let’s make sure we show up wherever we have to show up. And if you see anybody from that Cabinet in a restaurant, in a department store, at a gasoline station, you get out and you create a crowd.” Then there was former Attorney General Eric Holder, who declared: “When they go low, we kick ’em.” Even Democratic Senator Heidi Heitkamp repudiated Hillary Clinton’s recent comments as “unproductive” and “simply ridiculous” when Clinton advised Democrats to “abandon civility” with Republicans. I do want to clarify. I think I spoke in the heat of the moment–this has been a very emotional, and personally painful time for me. I think I exaggerated and I apologize for that. Ioffe and others of her ilk should contemplate the “very emotional, and personally painful time” for those who have been victimized by Islamic State jihadis. Ioffe’s blind hatred against Donald Trump is longstanding. In 2016, she was fired from Politico for an unhinged tweet that is too vulgar to write here. It was followed by a lame apology. She stated: “It was a tasteless, offensive tweet that I regret and have deleted…..I am truly and deeply sorry. It won’t happen again.” Well, it did happen again, only now she has escalated from vulgarity to incitement. “I think, you know, this president, one of the things that he really launched his presidential run on is talking about Islamic radicalization, and this president has radicalized so many more people than ISIS ever did,” Julia Ioffe said. “That’s just…it’s unconscionable for you to say that,” CNN’s David Urban shot back. Urban continued to push Ioffe on what she based her claim on. Tapper, as panelist David Urban pointed out on air, did not push back on Ioffe’s assertion whatsoever. He defended himself on Twitter from critics. Ioffe apologized on air later in the show. “I do want to clarify. I think I spoke in the heat of the moment–this has been a very emotional, and personally painful time for me. I think I exaggerated and I apologize for that,” she said…..
RELATED VIDEO: Trump crushes ISIS in Iraq and Syria. EDITORS NOTE: This column with images and video first appeared on Jihad Watch. It is republished with permission. CARAVAN JIHAD? Jihadis among the migrant caravan is not as ridiculous as CNN would have you believe. What’s more, Guatemalan President Jimmy Morales stated last Thursday that his security forces had caught “close to 100 people completely linked to terrorist issues, with ISIS and that not only have we arrested them within our territory, but they have been deported to their countries of origin.” Guatemala’s Secretary of Strategic Intelligence, Mario Duarte, confirmed that “the individuals intercepted, detained, prosecuted or returned to their country of origin, is close to 100.” He referred to “several citizens of Syrian origin who were detained with false documents were detained, for which they were prosecuted and subjected to criminal proceedings,” and then deported in 2016. The establishment media has made a great deal of the fact that Morales did not say that Guatemalan authorities had caught 100 Islamic State jihadis among the throngs approaching the U.S. border now. However, this is a distinction without a difference. If Islamic State jihadis could enter Guatemala previously, they can do it again, and they may have joined this caravan. There is also considerable Hizballah activity in Latin America – activity that analysts have been warning for years is a threat to the United States. But CNN and Denis Omar Contreras would have you believe that jihadists could not, simply could not possibly, have infiltrated this latest migrant caravan. Donald Trump is just being racist again to say so. If some of those on their way to the U.S. get into the country and commit an act of jihad violence, will CNN and Contreras and all the others who are sneering at Trump today apologize? Don’t bet on it. But the best-case scenario will be that no one from this caravan will get in at all, and CNN and the rest can go back to calling Trump “racist” for keeping them out. EDITORS NOTE: This column with images originally appeared on Jihad Watch. It is republished with permission. https://fitnaphobia.com/wp-content/uploads/caravan.jpg 366 645 Robert Spencer https://fitnaphobia.com/wp-content/uploads/logotext_white_312x71.png Robert Spencer2018-10-25 06:05:292018-10-25 06:05:29CARAVAN JIHAD? Jihadis among the migrant caravan is not as ridiculous as CNN would have you believe. Mass shootings, and they’re worried about a chimerical backlash against innocent Muslims that seldom, if ever, materializes. This is why they call CNN fake news. 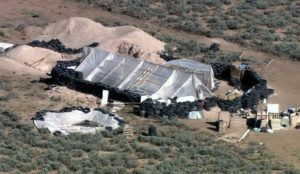 Taos County, New Mexico (CNN)The compound was hiding in plain sight, a white smudge in the dusty green expanse of sagebrush and juniper stretching across the Colorado-New Mexico border. A few feet past a handwritten “no trespassing” sign on the ground, a box truck sat unlocked. Inside, a wooden bunk bed was propped up against the wall, surrounded by piles of dirty clothing and worn-out books. Identity documents were mixed on the floor with children’s math workbooks, self-help guides and gun manuals. A dusty bulletproof vest lay nearby. It had been two weeks since law enforcement raided lot 78 in Costilla Meadows, a rural subdivision in Amalia, New Mexico, where homes are off the grid and you can see your nearest neighbor miles over the dry grassland. Police found 11 malnourished children there, shoeless and in tattered clothes, and arrested five adults. Days later, they found the remains of the 3-year-old boy they were searching for. Two weeks after the raid, reminders of the family’s monthslong stay were piled in heaps of garbage on the property, where they had built the compound on a lot belonging to someone else, adjacent to their own. Residents of this sparsely populated region of northern Taos County encountered members of the black Muslim family in familiar places: the gas station, the Family Dollar, the hardware store, the body shop. Little about the family members stood out, they said, apart from their dirty clothes and their skin color, a rarity in this area primarily populated by Hispanos — descendants of Spaniards who settled in the Southwest centuries ago. Otherwise, those who met them said they seemed friendly. A resident recalled how one of the men tenderly wiped the nose of a crying child. What little the residents knew about the compound didn’t raise eyebrows in an area where many people live “in unconventional ways,” as the judge in the case has said. Individuals from society’s periphery have long sought refuge in this part of the state, where cheap land far from the nearest power line or shopping center is easy to find. The region’s history of welcoming outsiders has contributed to cross-cultural exchanges and a tolerant attitude that locals consider points of pride. Many are quick to distance the state’s countercultural vibe from the compound and its inhabitants, who are accused of training the children to commit mass shootings. But they also fear that the publicity around a case infused with allegations of terrorism, child abuse and faith healing might contribute to a rise in racism and Islamophobia. “People come here and they want to be left alone and sometimes they do things that are unconventional,” said Malaquias “JR” Rael, whose family arrived in the Taos region in the mid-1800s. Newcomers are drawn to the area for its proximity to nature, breathtaking views and simple way of life, he says. Other families like his — predominantly Hispanos — have been here for generations. Rael owns North Star Tire & Auto in Questa, a mountain town of some 2,000 people about 30 minutes from the compound and another 30-minute drive from Taos, the nearest “big city.” Given his family tree, it’s a place where Rael can’t go far without being greeted by a customer or relative. One of the men from the compound, Lucas Morten, visited Rael’s body shop in early spring looking to buy a large quantity of tires. “He seemed real personable, very mild-mannered,” Rael recalled over a smothered burrito lunch on a recent weekday in Questa. Morten said he planned to build an “earthship,” a self-sustaining home made from natural and upcycled materials, which uses tires packed with earth as bricks. “I said, ‘OK, good luck,’ because it’s real labor intensive,” Rael said. Otherwise, nothing about the request raised any red flags, he said. Plenty of people live off the grid here in various types of homes that don’t use public energy sources or fossil fuels, he said. Not him, though. “There’s nothing wrong with being normal,” he jokes…. Of course, because the whole thing was — contrary to CNN’s denials — a media creation from beginning to end. As the President said, CNN is fake news. So is the rest of the establishment media. It is the land of Muslim anti-terror protests and loutish men in Make America Great Again hats committing anti-Muslim hate crimes. It is, in short, a near-total inversion of reality. Early this week, CNN was accused of staging a Muslim-led anti-terror protest after the London terror attacks. Now, more footage has dropped that shows what happened on the scene before the CNN shot was taken. A Youtube video taken by Claire Jordan shows her milling around the scene and “protest” prior to CNN lining up the protesters for their on-air shot. There is a group of people in the area, both Muslim and non-Muslim, and some of them can be seen handing out bouquets of flowers and posters. There are daily accusations by Putin, jailed Turkish journalists and third parties that illegal ISIS profiteering constitute “a family business” benefiting President Erdogan and his son, Bilal. These allegations erupted in the wake of the downing of a Russian SU-24 November 24, 2015 after allegedly being warned by Turkish military to stop intruding Turkish air space. Premier Davutoglu gave permission to Turkish F-16s to launch a missile to take out the errant Russian jet fighter. The plane fell into an area inside Syria along the border in Latakia province occupied by rebel Turkmen militias. The pilot of the SU-24 was killed, while the co-pilot parachuted and was rescued in an operation by none other than “wounded” Iranian Quds Force Commander, Gen. Qasem Soliemani. The Russian co-pilot refuted the Turkish allegations saying that their aircraft had not intruded Turkish airspace. Obama met Turkish President Tayyip Erdogan in Paris, where they have been attending a climate summit, a week after Turkish jets shot down a Russian warplane along the Syrian border. Obama stressed that U.S. support for its NATO ally’s security remained steadfast. Obama told Erdogan that the Islamic State militant group, also known as ISIL, must be pursued by all sides, echoing a message he delivered to Russian President Vladimir Putin on Monday. “We all have a common enemy, and that is ISIL, and I want to make sure that we focus on that threat,” Obama said. Israeli Prime Minister Benjamin Netanyahu stressed the importance of Israeli-Russian military cooperation to prevent “unnecessary accidents” at a meeting with Russian President Vladimir Putin in Paris, a Reuters reporter at the talks said. Putin, likewise, praised the “mechanism of cooperation” which the two sides had established in relation to Russia’s military operations in Syria. Achieving any détente between Putin and Erdogan at this time was increasingly complicated by announcement of Russian sanctions against Turkey trade in gas, food and other commodities coupled with a virtual stop in Russian tourism in punishment for downing the Russian plane. However, behind these allegations were a stream of daily investigative reports from RT, Zero Hedge and other media accusing the Turkish President of playing a double game profiting from ISIS and Iraqi Kurdish Regional Government (KRG) oil sales. Putin maintained that was the real reason behind the downing of the SU-24 jet. The implication was those Syrian Turkmen in the eponymous Mountains in Latakia province may have been involved in cross border oil, commodity and weapons deals with ISIS and alleged ‘rebels. After French President Hollande finished a Washington, D.C. press conference with President Obama on November 24, 2015, Hollande flew off to meet Putin in Moscow, hoping to launch “a grand coalition” to destroy ISIS. He accused the Islamic State of committing “an act of war” with Jihadis perpetrating the massacres in Paris on November 13, 2015 that killed 130 innocent civilians, injured more than 350, including 99 seriously. Russia and France began aerial bombing attacks against ISIS occupied oil infrastructure and interdicting oil transport trucks headed towards an open stretch of the open Syrian border with Turkey. Meanwhile CENTCOM, for its part in its oil bombing raids, dropped leaflets in Arabic and English suggesting drivers of these oil tanker trucks to skedaddle giving ISIS 45 minutes of advanced warning. Bilal Erdogan, principal in BMZ, Ltd.
Bilal Erdogan’s ownership interest in BMZ, Ltd. was a key factor in this illegal oil trade given operations from the energy terminal port of Ceyhan on the Mediterranean coast.. BMZ has a fleet of oil tanker ships engaging in transfer operations in the Mediterranean for KRG sourced oil. Some of those offshore transfer deals ended up supplying oil to Israel , while other shipments may have gone to Japan and other energy markets. Connections involved a shadowy Saudi billionaire who the US has designated a terrorist financier, Yasin al-Qadi. Also involved was the Turkish intelligence service, (MIT) and Erdogan’s son Bilal. They conspired to use Muslim charities to channel funds to an al Qaeda affiliate in Syria, the Al-Nusrah Front.
. Interesting in light of the current allegations, Bilal left Turkey for Bologna, Italy in mid October to renew a PhD program at the Johns Hopkins U School for Advanced International Studies Center there. Bilal graduated from the Harvard Kennedy School. Comments by German Foreign Ministry spokeswoman Sawsan Chebli saying Tuesday that her country has not seen any solid proof of the Russian claims. The Anadolu report pointed to a European Council document from March noting that Haswani “provides support and benefits from” Assad’s government through the ISIS oil purchases. “He also benefits from the regime through favorable treatment including the award of a contract (as a subcontractor) with Stroytransgaz, a major Russian oil company,” the document said. There was a purported ace up Erdogan’s sleeve to counter Russian sanctions, and loss in tourism; closing the Bosporus Straits and Dardanelles to Russian commercial, naval resupply and war vessels traffic. There was another Turkish precedent. During WWI the Young Turks used reflagged German cruisers along with mining of those Black Sea Straits to block the Straits. That blocked the Czarist Black Sea Fleet and thwarted the British breakthrough leading to the debacle at Gallipoli. To prevent a reoccurrence a multi-national 1936 Montreaux Convention was signed preventing a similar closure of the Bosporus Straits and Dardanelles traffic. Gordon: Why does Erdogan’s Turkey oppose Syrian YPG forces going further West than Kobani in Syria? Audino: Because Turkey fears nothing more than a contiguous Kurdish belt stretching along their southern border with Syria. Right now the Kurds have nearly achieved that. Their control extends from the Iraqi border westward several hundred miles to Kobani. They pick up again at Afrin on the west side of Aleppo. The only portion of it not controlled by Kurdish YPG is the 100 km gap between Aleppo and Kobani. Not so coincidentally, that is the precise location for the so-called ISIS-free Zone the Turks propose to administer. A blind man can see it has far less to do with defeating ISIS than it has to do with blocking further progress to complete the contiguous Kurdish belt. Incidentally, this gap is also the reported avenue for much of the materiel and personnel support for ISIS in Syria. A great deal of it comes in from Turkey, and most of it flows through that gap. The Kurds know this well, and have expressed no opposition whatsoever for an ISIS-free zone in that gap. What they oppose is a Turkish–controlled ISIS-free zone. How monstrous will the mainstream media get before the whole thing breaks apart? No telling. But this indicates that it is certainly descending to the murky depths already. A CNN reporter says that what really has shaken the people of Paris in the aftermath of the Nov. 13 terror attacks is that this time those killed by Islamist terrorists weren’t just Jews or provocative cartoonists. Talking to CNN host Don Lemon Monday night, reporter Martin Savidge tried to convey why the people of Paris view the Nov. 13 terror attacks differently than last January’s Islamist terror attacks in Paris that targeted French cartoonists and Jews in a kosher grocery store. RELATED ARTICLE: Joyce Carol Oates: “Is there nothing celebratory & joyous” about ISIS?